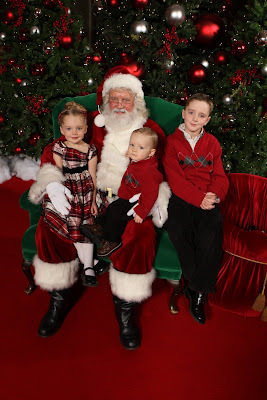 Getting the kids' picture with Santa began 7 years ago with Jacob's first Christmas. This year, we almost chose to forego the tradition because of such a crazy December schedule. But, what good is a tradition if it can just be tossed aside when life gets busy? 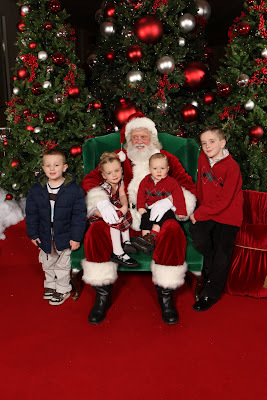 So after throwing coordinating outfits on the kiddos, we made the annual trek to the South Hill Mall to once again visit Old Saint Nick. 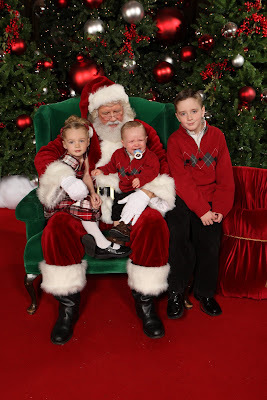 FYI: Tradition in our family also dictates that the first "official" Santa picture of each of our kids has to include some crying. Landon did not disappoint. For some reason he just doesn't quite get the point of the song "Santa Claus is Coming to Town" and the fact that he shouldn't pout or cry. You may have noticed a "4th child" in the last two pictures. That's our awesome nephew Nick. 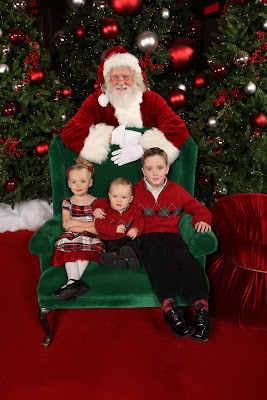 (No relation to Old St. Nick) We had the privilege of watching him for a few days and he got to come along to meet Santa. BILL! That Santa is one of Chris' customers. We are hoping to go see him this week and he's going to make it extra special for the girls. Anyway, I should have posted about that so my local friends could tell him they know Chris and get the royal Santa treatment (whatever that might be). Anyway, darling pics. Good call on that last one where the kids are alone on the chair. I love those first 2 pictures! Priceless :) This is actually the first year I didn't have a crying baby in the picture. 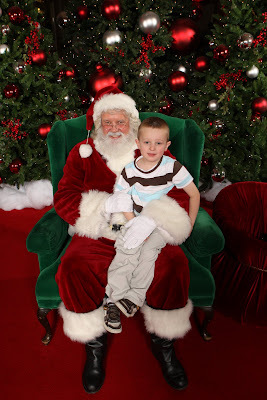 Zac is 2 now and he thought Santa was pretty cool. Those photos are GREAT!! 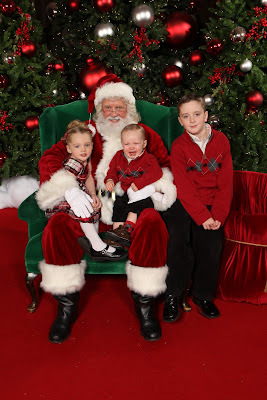 Why does it make me giggle when kids cry in santa's lap? We saw santa at a party last week and Maddie ran away from him. So funny!